Is the iPad Pro just an iPad that’s harder to hold? The rumour mill was right. Apple really was working on a big-screen iPad, and last night it unveiled the result. The iPad Pro is the biggest iPad ever, but is it the best? Here's how it compares to the iPad Air 2. The iPad Pro has a 12.9-inch screen delivering 2,732 x 2,048 pixels at a density of 264 pixels per inch. It's 305.7 x 220.6 x 6.9mm and weighs 713g. The iPad Air 2 has a 9.7-inch screen delivering 2,048 x 1,536 at 264ppi. It's 240 x 169.5 x 6.1mm and weighs 437g. Both iPads come in three colour choices: silver, gold and space grey. The iPad Pro has Apple's latest A9X processor, a third-generation 64-bit chip with an integrated motion co-processor. The iPad Air 2 has the previous generation processor, the A8X, along with a separate M8 motion co-processor. According to Apple, the Pro CPU is 2.5x faster and the graphics 5x faster than the iPad Air, while the Air 2 CPU is 1.4x faster and its graphics 2.5x faster. The iPad Pro comes in three variants: 32GB and 128GB Wi-Fi models, and a 128GB Wi-Fi/Cellular model. The Air has 16/64/128GB in both Wi-Fi and Wi-Fi/Cellular guises. Both iPads have 8MP iSight cameras with identical specs, and the front facing cameras are 1.2MP FaceTime HD cameras. The iPad Air 2 has stereo speakers but the Pro packs four speakers into its case, and those speakers use clever algorithms to detect how you're holding the iPad Pro, adjusting each speaker's volume accordingly. Both iPads claim identical battery life: up to 10 hours of web surfing on Wi-Fi, watching videos or listening to music, or 9 hours of web surfing using mobile data. Both iPads use Lightning connectors to charge. Once again the specs are identical here: Wi-Fi (802.11a/b/g/n/ac) with MIMO, Bluetooth 4.2, GSM/EDGE/CDMA/UMTS/HSPA/4G LTE. The iPad Pro has one more connector, though: a keyboard connector for the Surface-esque keyboard cover. Another set of identical specs: TouchID, a three-axis gyro sensor, an accelerometer, an ambient light sensor and a barometer. However, there's also the Apple Pencil, which is an optional extra for the iPad Pro only. It adds pressure and tilt sensing that makes it particularly well suited to drawing apps and CAD. Both iPads run iOS 9, but while they're almost identical the larger screen of the iPad Pro makes the side-by-side apps in iOS 9 even more useful: it effectively delivers split-screen multitasking in much the same way a certain Microsoft operating system does. Because the screen is as wide as the iPad Air is high, there's more than enough room to do two things at once. The iPad Air 2 is already on sale and the iPad Pro will be available in November 2015. The iPad Air starts at £399 for the 16GB model, rising to £479 for 64GB and £559 for 128GB. If you want the Wi-Fi and Cellular model, prices for that are £100 more for each configuration. For now, Apple has only announced US prices: $799 for the 32GB Wi-Fi, $949 for 128GB Wi-Fi and $1,079 for the 128GB Wi-Fi and Cellular model. Current US pricing for the Air 2 is $499/$599/$699 for Wi-Fi, which suggests that UK prices should start at around the £699 mark. Accessories such as the Apple Pencil and the iPad Pro keyboard cost more: $99 and $169 apiece and will only work with the iPad Pro. iPad Pro vs iPad Air 2: which is best? Naturally we'd recommend waiting for the in-depth reviews, but based on what we've seen so far we'd recommend the iPad Air for anybody on a budget, or who doesn't need a big screen and better speakers. 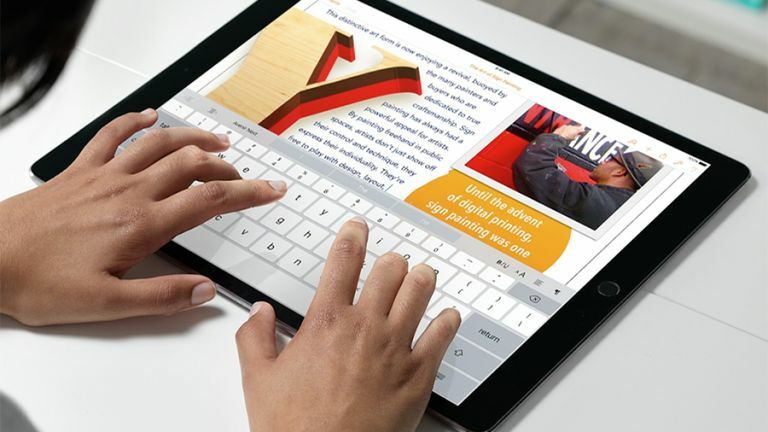 However, if you wished Apple made a Surface or just find the Air a little bit cramped for the reading, writing and viewing you want to do, then the iPad Pro looks amazing - and while it's a lot more expensive than other iPads it isn't particularly pricey when you look at the cost of Apple laptops. Bear in mind, though, that while it's almost as slim as the Air it's significantly heavier - so if you're looking for something to cart around all day or to hold while you lounge around, that extra weight will make a real difference. It's roughly the same weight as the first iPad, but it's nearly double the weight of the most recent ones. It might be a good idea to play with one in your nearest Apple emporium before committing any of your cash.